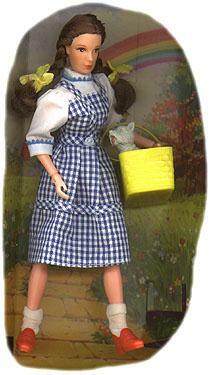 One of Mego's very successful lines was the Wizard of Oz Collection. The crafting and detailing of these figures was marvelous. Thanks to the long-time collectability of WOZ stuff, there are many mint figures to be found on the cheap. Figures are pictured with the insert art from the boxes the came in. The story, if you haven't seen it, is about a young girl from Kansas, Dorothy, and her little dog Toto who are transported via tornado to the Magical Land of Oz. When she arrives, she drops a house on this bad witch, and meets a Good Witch, named Glinda.